MLK is one of my heroes. Not only did he do the right thing. But he did the right thing, under the toughest of circumstances and in the right way. He overcame hatred with the transforming power of love. He stared down ignorance with understanding. And he fought not only for a portion of the population, but for well-being of the entire world, demonstrating his concept of the beloved community. To me, that’s incredibly inspirational. But how do you share these huge ideas and big concepts with little ears and young listeners? As a musician, I felt moved to write a song and try to put some of these concepts into the lyrics. I hoped the song would be a singable way to talk about MLK’s dream as well as a good place to start conversations about these big ideas and what they might mean to our classrooms, families and communities as we move into a new era. 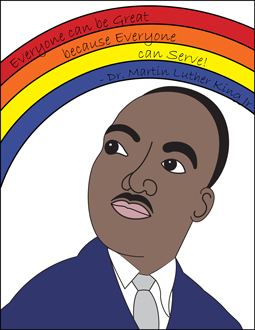 In honor of the 50th Anniversary of the landmark “I Have A Dream Speech”, we’ve offered the song as a free download as well as coloring pages that share powerful quotes from many of MLK’s inspirational speeches. We hope that people use and enjoy these resources as they not only look back at this historic event – but dare to look forward and continue to dream! The direct link to the download is: http://www.dariamusic.com/monthly_song.php. For more information, visit my site or contact me at daria at makemusicwithme dot com. I’d love to hear from you! Most historians believe that about 4,000 years ago, craftspeople in the region around China began experimenting with metal and bronze. Although the region around China, Tibet, Nepal and Southern Asia is quite diverse, these countries share a common history of discovering and creating unique musical instruments made from metal such as gongs, bells, singing bowls and handbells known as tinghsa. 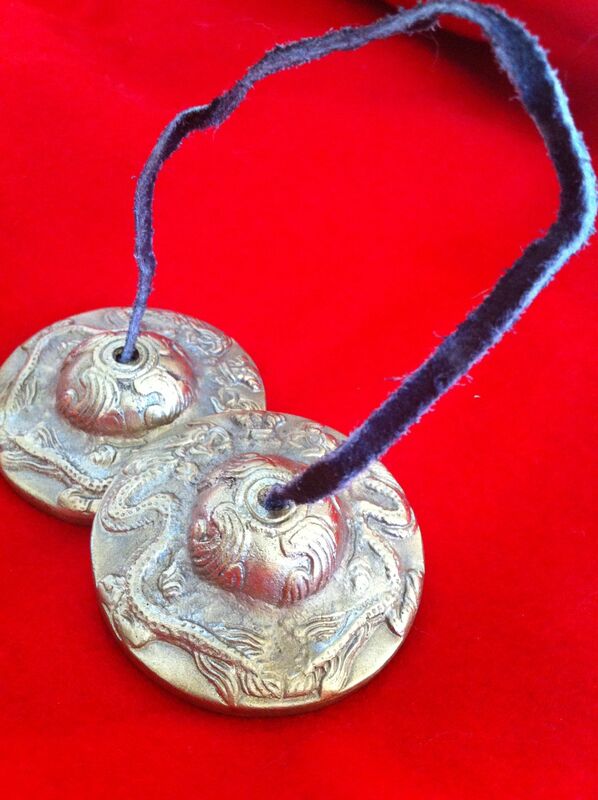 Tingsha (also, ting-sha) are two small, rather heavy cymbals that are attached to a rope or piece of rawhide. They are usually about 2.5 to 4 inches in diameter and can be plain or have decorative images on them. Some have symbols such as dragons that are considered lucky or they may have mantras or other words or phrases that are a part of prayer or devotional practices. Want to make your own version? Here is an easy project to create your own tingsha bells out of recycled materials. Paint, textured paint or glitter and glue for decorating the handbells. Start by creating a hole in the center of each of the bottlecaps. You can do this by putting the bottlecap; outer side up, on a work surface (such as a spare piece of wood) and tapping it gently with a hammer and nail or use a hammer and awl. Once you’ve created the hole, it’s a good idea to turn the cap over and tap it with a hammer to flatten the sharp edges around the hole. This makes it safer to handle when adding the string. To decorate your two “cymbals”, you can paint or add textured fabric paint. You can also apply glue and glitter. When you’re done and they are dry, you are ready to string them together. Thread the strong or yarn through each side and make a knot to hold it into place. Check that you like the length of your tinghsa and adjust the knots accordingly. Celebrating Holiday Traditions With Song! All over the world people are celebrating this joyous season in so many different ways. There are beautiful religious ceremonies, family and community activities, decorations, presents, great food. And then, there’s music. As a musician and a global traveler, I wanted to share some favorite melodies and music that create holiday magic in various cultures throughout the world. One song heard in almost three dozen languages around the globe is Jingle Bells. You might be surprised to find out that this song was actually written for Thanksgiving. If you listen to the song carefully, you’ll notice that there isn’t a single reference to Christmas in it! Instead, an American minister named James Lord Pierpont wrote the song in 1850 about sleigh rides in the snow and performed it at his church in November. It was such a hit that everyone requested it for Christmas and the song grew in popularity and has since become associated with this special time of year. Check out this animation of Jingle Bells. In the video, you can see holiday greetings in 18 different languages from Spanish, French, German and Portuguese to Turkish, Swedish, Romanian and Hawaiian. Want a closer look at these greetings? There’s a pdf link below for how to wish someone a merry Christmas or happy holidays in each of these world languages. Do sleigh bells conjure up the magic of Christmas for you? In Greece, it’s the sound of a musical triangle instead. When my husband was young, he participated in Greek caroling and went door to door in Athens singing special songs accompanied by a triangle. 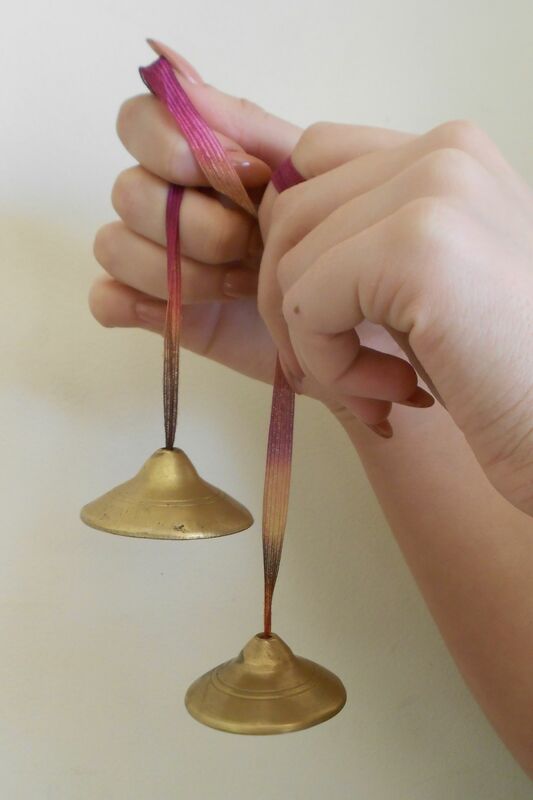 Read more about this lovely tradition here or you can make your own sets of jingling bells, rocking rattles or other instruments to add to your holiday fun by visiting the musical crafts link below. And how do you say “Merry Christmas” in the Spanish speaking world? It’s Feliz Navidad and you can hear it here in one of the most popular Christmas songs with lyrics in both Spanish and English. Written by Puerto Rican composer and musician, José Feliciano, this song has made its way around the world over and over again and has a way of bringing holiday cheer – no matter what language you speak! But let’s not forget the holiday of Hanukkah. Whether you practice the Jewish faith or not, the holiday inspires a sense of miracles, joy and renewal that helps us all make it through the long winter and look forward to new beginnings and a new year. If you want to learn how to play the dreydl (also spelled dreidel) game, you can check out this music video. Hidden in this simple child’s game is a wonderful message. Watch the video or read the post below to find out what it is. And just as Christmas traditions vary from country to country, people also celebrate Hanukkah all around the globe. However, certain things remain constant and you can see many of them in this Hanukkah video of a song from Spain, such as the custom of gathering with friends, making delicious foods and special sweets, giving presents and lighting the menorah. The menorah takes center stage in this video that counts out the 8 little candles in the language of Ladino – a mix of Hebrew and Spanish. In fact, if you speak Spanish, you will easily be able to count along to the 8 candles in the chorus of the song. No matter what holiday you celebrate – this season can bring great joy to your home and your community. It’s a great time to discover how others celebrate this time of year as well as connect with your own cultural roots and deepen your faith and spiritual understanding of the world. And as you do – I hope you add a little music to share your holiday joy in song! The beautiful, wide and diverse continent of Africa has some truly amazing and clever musical creations. One of my favorites is a small percussion instrument called a tongue rattle. Generally made from carved wood, the rattle is shaken quickly back and forth and a “tongue” within the two carved sides makes a noise like a person who just can’t stop talking. It’s loud, funny, clever and a great way to allow kids to explore making rhythms and creating music. To make a homemade version of a tongue rattle, you need two (same size) plastic or styrofoam cups, tape, two twist-ties, yarn or string and some small items for making noise inside the cups. Beads, paper clips, buttons or metal washers all work perfectly for this craft. To make your cups work like a tongue rattle, turn them over and poke two holes in the top. Next, fold a small twist-tie in half. Then, take a small string or a piece of embroidery thread and string beads, buttons or other noise-makers onto it and tie it into a circle. Slip the string circle with the noise-makers onto the twist tie and twist that into place, attaching it inside the cup. Adjust your string for size so that it will rattle about an inch or so from the far end of the cup. Here’s a picture of what that might look like. Once you’ve assembled both cups, place them together and tape them up. Now you’re set to move your hand back and forth and get the same kind of sound that’s made by one of these unusual African instruments. If you want to make several rattles you can compare how different ones might sound. 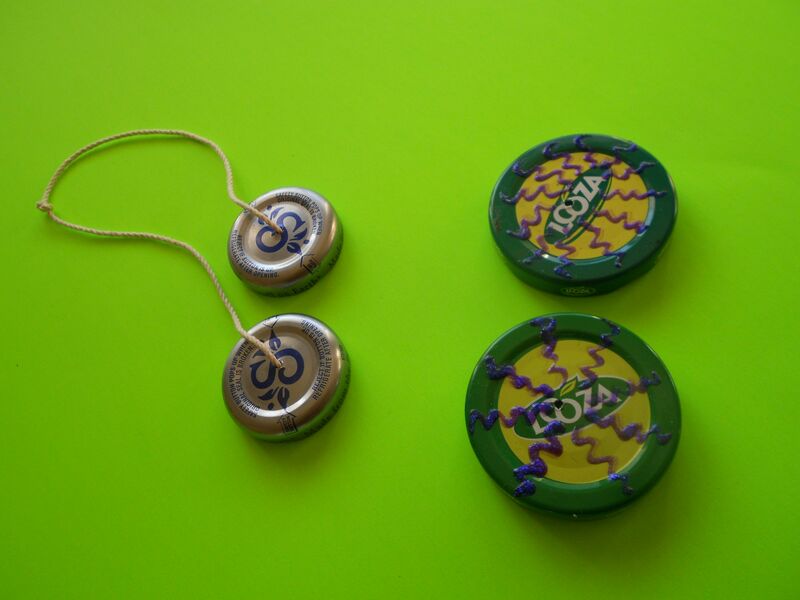 A rattle made with two plastic cups using heavier beads or metal washers as noise-makers may be rather loud. A rattle made with two styrofoam cups and plastic paper clips may be a bit quieter. You may want to experiment with what’s inside that creates sound or what’s on the outside as decoration for your musical creation. 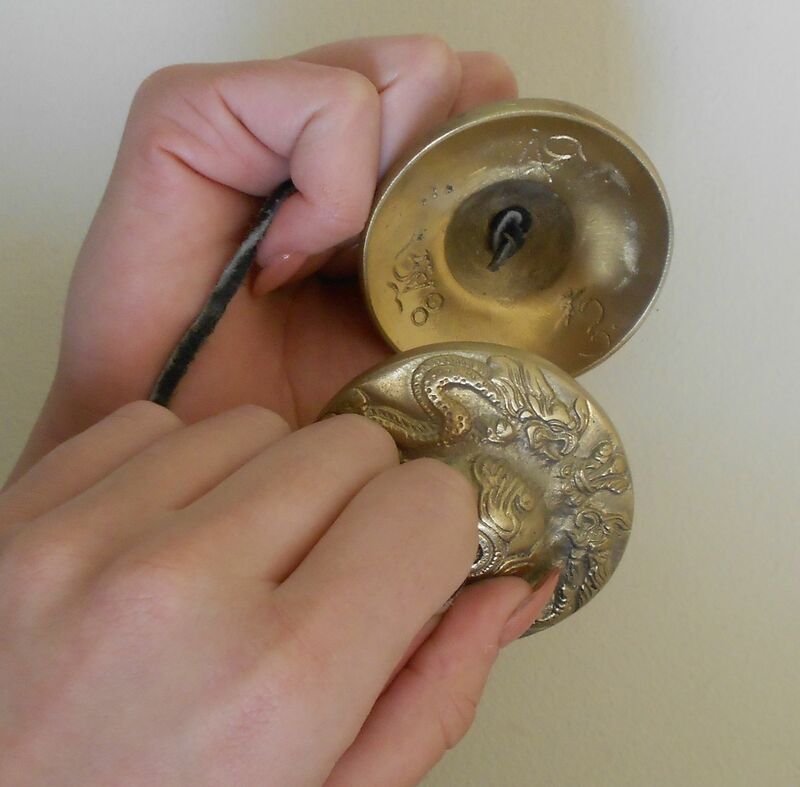 To play a tongue rattle, flick your wrist back and forth while holding it. Play it slowly. Play it quickly. Or try something tricky like starting slowly, going faster and faster and then come to a complete stop. Sounds cool – doesn’t it? After you’ve discovered some of the sounds your rattle can make, put on some of your favorite music and play along. See if you can play in time with the beat or match the rhythm you’re hearing. You might be surprised at how this simple instrument can really speak to you! Musical instruments can be as diverse as the many peoples and cultures on the planet. One of my favorite unique instruments is a traditional rattle from comes from Afro Peruvian culture called the quijada. Made from the jawbone of a donkey (the word quijada means jawbone in Spanish), the instrument looks more like an artifact from a museum than an instrument used in a musical band! And, it’s loud. The jawbone is held in one hand and punched firmly with the other fist. When the long teeth shake back and forth in the sockets, a loud, rattling or buzzing sound is created. Since the teeth are slightly uneven, some percussionists also play this jawbone by dragging a stick or rasp over it like a guiro. Believe it or not, the lower jawbone of a donkey, horse or zebra is also used in several other cultures, with different names and slightly different methods of playing, of course. According to music historians, you can find similar jawbone instruments in Argentina, Costa Rica, the Dominican Republic, and in some types of Mexican folk traditions such as “Costa Chica” music. Can you make your own version of a quijada at home? Since jawbones aren’t handy around most homes, creating an authentic one might be difficult. However, you can create the type of rattling percussion made by this instrument by using egg cartons, tape and some form of mock teeth that can rattle in your container. The result can be a great-sounding “monster” rattle! Aside from materials you might use for decoration, all you need is an extra egg carton, packing tape and objects that can fit in the 12 spaces of the container. What can you use? Practically anything. Look around for items like large pebbles, dried pasta, buttons, coins, large beads, seashells, or even small pine cones. Each will make a slightly different sound when the carton is closed and you rap on the side. Experiment with the sounds created when you place different objects in your rattle. Once you’ve found the combination you like, move on to decorating the outside. Would you like to give your rattle a face? We’ve created eight different creatures you can color and add to the top of your egg carton. You can find them at the craft url below. Or create your own look or design. Use paint, glitter, glue and create something truly unique. The last step is to seal up your rattle. Since many egg cartons have open spaces in them, make sure to tape them closed. Clear packing tape works well here. This keeps the contents inside and makes it a more sturdy, child-proof instrument to play with. If you want to play your monster rattle like a quijada, hold it in one hand and rap it with the side of fist of your other hand. However, since this is a rattle, you can play with it in any number of other ways. Shake it back and forth, up and down, start slow and go faster. Play along with your favorite songs and see if you can match the beats. Or sing a favorite song and let your rattle keep the time. The song La Bamba is known and loved all around the world – even in places that don’t speak Spanish. And you might be surprised to hear that the most popular version of this song was sung by Richie Valens who didn’t speak Spanish but learned the words phonetically from his aunt! Nevertheless, the song has a special kind of magic that shares a sense of happiness and celebration that has made it a favorite all around the globe! Where did La Bamba come from? It started as a simple folksong from the region of Vera Cruz, Mexico. Most folklorists guess that the title comes from the Spanish verb “bambolear” which can mean to “to shake” or “to stomp”. It was an active dance, popular at weddings. In one folk ensemble’s version of this dance, the bride and the groom perform this dance together, doing the same set of intricate steps and creating an actual bow out of a long red ribbon (listón) by way of their fancy footwork. In many versions of La Bamba, the song gets faster and faster towards the end. And, the words? There’s no definitive set of lyrics because many of the verses were improvised. The tune and the chorus were well known in Mexico, however, clever singers or deejays would add new verses in order to charm or amuse their audiences. Although the chorus stayed the same, many different verses could be heard from one singing group to another and from one recording to another! In 1958, Richie Valens recorded the version that would one day be inducted into the Rock and Roll Hall of Fame. His aunt, Ernestine Reyes, helped him pronounce the lyrics and his fellow band members added a more modern, rock edge to the song. La Bamba climbed the charts and eventually made it’s way to # 345 in Rolling Stone’s Magazine’s List of the 500 Greatest Songs of All Time. In fact, it’s the only song on the list that’s not in English! Since that time, La Bamba has been recorded by artists such as Harry Belafonte and Los Lobos and even a version in Greek as well as several other languages. Few songs share the honor of being recorded by such a wide group of performers from mariachis, to punk bands, disco singers to folksingers and even international artists! Play A Kalimba (Thumb Piano) Online! Thanks to PBS Kids’ Go, you can actually play an African style thumb piano online. Check out the link below. In addition to being able to “play” the instrument (touch the tines and hear the sound), you can record your own tunes – what fun! On this website you can also explore other related aspects of African culture such as traditional masks and how to make them and a Swahili folktale about Prince Sadaka. Kudos to PBS Kids for creating such fun and interactive resources that share, preserve and inspire kids to learn more about traditional cultures! Many parents and teachers are concerned about finding great spots for kids to enjoy on the internet and how to avoid colorful or inappropriate content. So if a parent or educator wants to share music, entertainment and world culture with their young child, what are their best choices? 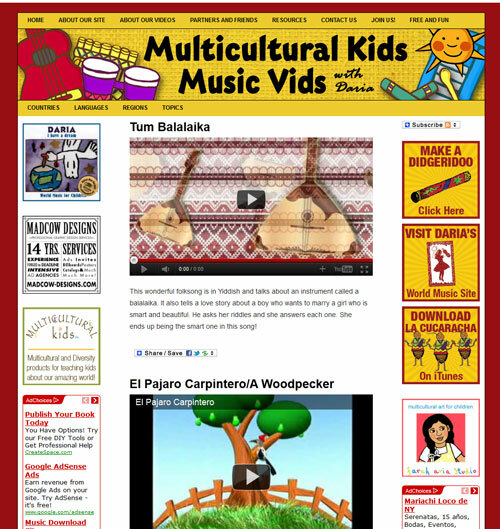 Although several positive music and video websites for children exist – such as Kideos and Jitterbug, one award-winning children’s performer has also created a great space dedicated to world music called Multicultural Kids Music Vid’s (http://multikidsmusicvids.com). It’s a family-friendly place to experience world cultures through music, dance, instruments and related high quality animations and videos. In addition, viewers are invited to suggest videos and win a free multicultural children’s music cd if their choice is selected as an “Add”. Featuring Videos From Around The World, You Never Know What You'll Find On Multicultural Kids Music Vids! Created by 5 time award-winning children’s performer DARIA (Daria Marmaluk-Hajioannou), this site now has videos from a variety of sources in over 20 languages and adds new ones approximately every two weeks. From popular bilingual songs in Spanish and English to animations of children’s rhymes from India, travel videos of Africa, Turkish lullabyes and a series of silly gummy bear videos, the site shares a rainbow of world cultures as expressed through their music and cultural traditions. In addition, there are generally one inspiring or silly video per new installment and “how-to” videos about instruments that can be found around the world or kids who have created or perform on instruments in new or unique ways. For complete information on Multicultural Kids Music Vid’s, visit http://multikidsmusicvids.com. For more on website creator, DARIA, visit her website at www.dariamusic.com, follow her on Twitter (dariasmusic) or visit her DARIA MUSIC Facebook Fan Page. Although Cinco De Mayo is celebrated in May and Hispanic heritage is highlighted in the USA from September 15 – October 15th, any time of year is great for making and exploring Latin American culture with this simple musical craft. Maracas are one of the simplest instruments to play for young children or the beginning musician. They are essentially rattles with handles. They come in pairs. You put one in each hand and you shake, rattle and roll! Of course, if you’ve seen experienced percussionists play maracas, you would be amazed at what they can make them do. So, a pair of maracas are versatile little instruments for “just jamming with the kids” or for exploring rhythms, beats and tempos as a fun way to learn more about music. Most folks consider maracas to be native to Latin America, however, similar instruments (pairs of rattles) can be found in cultures around the world. Most often associated with the music of Cuba, Puerto Rico, Colombia, Venezuela, Jamaica and Brazil, maracas have been played for centuries. One set of maracas made of clay were found in ruins in present day Columbia. They were used by the indigenous people of that area and dated back to almost 1,500 years ago. Maracas come in all sorts of sizes, shapes and designs! What are maracas made of? Most traditional maracas are made from natural materials such as gourds, clay, wood or coconut shells. More modern ones can be made of plastic, leather or other synthetic materials. They are filled with small objects such as seeds, pebbles or dried beans. To create “recycled rattles” you can start with smaller water bottles from the recycling bin and be even more clever with fillings – finding things you can easily use from around the house, garage or in your junk drawer. Get Out Your Materials ! Although you can use any type of small plastic bottles, the 8 oz (236 mL) size water bottles are just perfect for this project in size and shape. If you’ve sworn off plastic, then ask around. A neighbor, classmate or local store may offer you what they might have sent out as recycling. You’ll also need two toilet paper rolls and some sturdy tape. Electrical tape works best and colorful electrical tape adds a nice decorative touch to what you are creating. A complete supply list is provided below as well as some suggestions for great sounding maraca combinations. First take your clean and dried 8 oz water bottle and fill with your chosen contents. Close it up with the cap and then listen to the sound. Once it sounds good to your ears, then you can move to the next step. But first, check out how many professional maracas are made – they are created to be slightly different in sound. Many sets of maracas are “pitched” differently. In other words, shaking the right hand one will sound different from shaking the left hand one, so you can create some great patterns by playing with the sounds. For instance, if you make my version of rice and beans maracas (described below), the rice will be sound a bit softer and higher in pitch, the beans a bit louder and lower in pitch, so you can build rhythms on those sounds. You can also describe the rhythms in a fun way, such as rice, rice, beans, rice, rice beans or rice, beans, rice, rice beans. Almost anyone can learn new rhythms and even complicated rhythm patterns with this creative approach. Do you want to just jam? Then simply pick up your instrument and shake, shake, shake. Or dance around, move and groove, and shake things up to your heart’s content. If you want to get into more of the maraca’s musical possibilities, then take some time to check out what they can do. Aside from shaking them back and forth where the sound comes from the contents striking the sides, you can swoosh them around. By moving your hand in a circular motion, the contents of your maracas won’t hit side to side, but will whoosh a bit around in the bottle, creating a different sound. You can also “crescendo” your maracas. You start by shaking them quietly and slightly and then build little by little to get the loudest sound. It’s a fun way to begin or end a song. You can also make several pairs and mix and match. What sound patterns can you create? Which maracas sound best to you or sound best as pairs? Does a certain pattern sound like a song you know? Or does a song you know inspire a new pattern? Despite the fact that these are really simple little instruments, they can truly inspire hours of musical fun. Rice in one maraca, beans in the other. The color and the sound are different, making it really easy to create patterns. Colorful paper clips in one, small extra erasers in the other. A nice difference in the sound between the right and left hand. These are really quiet and subtle. The sand or salt maraca is softer then the tiny pasta (choose acini de pepe, pastina or orzo pasta) making this a great choice for kids that want to learn to listen, kids with noise sensitivity or for learning some of the aspects of playing a percussion instrument quietly but effectively. Have you ever seen a shekere from Africa? It is a beautiful musical instrument made from a dried gourd that is shaken, tossed or moved from hand to hand creating wonderful rhythms and songs. Traditional shekeres (or sekeres) are most often made from a type of squash called a birdhouse gourd that grows in many locations around the world. It is grown, dried and about a year later, ready to be turned into an instrument. When the outside of the gourd hardens into a thick shell, it is strung with a netting that fits loosely around the rounded part of the gourd. 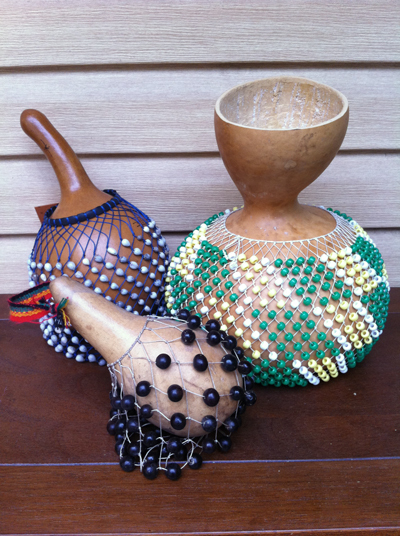 Beads, seeds, shells or other rattling objects are attached to the netting to create the percussive sound of the shekere. Since gourds may be hard to find and take some time to dry, here is a simplified version of this musical craft that uses stickers and recycled milk jugs. Also, working with netting and beads can be difficult for tiny hands, so this craft allows young children to create beautiful patterns that are unique and still have an instrument that is fun to play along with African songs or any uptempo music. A complete supply list for this project is below. First, wash and clean your milk jug and keep the lid or cap. If you are working with many children, you may wish to put each child’s name on their milk jug for identification, should some of the shekeres look similar. 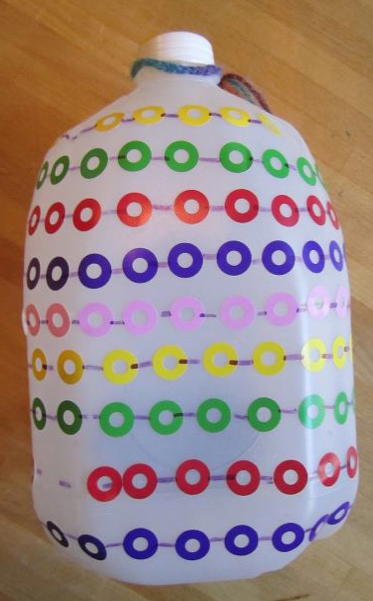 Next, allow your students to do their beading, either free form by applying stickers anywhere on the milk jug or you can draw string patterns for them to show where a bead or sticker would go. If you like, you can talk about patterns of colors and different ways that patterns can be created. Once your shekere is “beaded”, then add the filling. Fillings that create quieter shekeres are sand, salt, sugar, Q-tips, seed beads or tiny pasta such as pastina. Slightly louder shekeres can be made with fillings like paper clips, bird seed, rice, pony beads, or smaller beans such as lentils. Louder shekeres can be created by adding large dried macaroni, or beans, pebbles, larger beads or even jingle bells. After filling your shekeres, seal the instrument with sturdy electrical tape by wrapping it around the lid and the top section of the plastic jug. This way the contents are secure inside, especially if working with younger children. If you can find colorful electrical tape, it adds a nice design element. If you like, add colorful yarn or pipecleaners to create a handle for your milk jug shekere. The shekere can be played like a rattle, simply shaking it around. It can also be held in one hand and then tapped on the other hand, like you might play a tambourine. It can be tossed gently from one hand to the other. It can be played by tossing gently from one person to another and works well in a circle. Some players “burp” their shekere. They hold it in one hand and tap the bottom with the other hand. On gourds, this creates not only a rattling but an “ah” sound. If you try this with your milk jug shekere, you’ll get a rattle and a tap, a nice percussive effect. What other sounds can your sticker shekere make? Explore it and find out. Stickers (such as paper reinforcements or the little round stickers used to price items at garage sales). Filling for the shekere – such as bird seed, dried macaroni, beans, beads, rice, sugar, salt, paper clips or small pebbles.